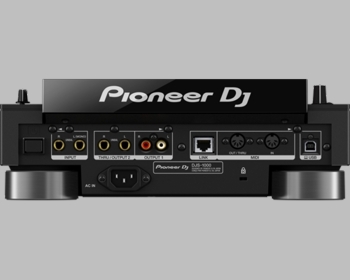 Pioneer DJ DJS-1000 Standalone DJ Sampler DJParts - All Variety of Parts that DJ Needs. Elevate your performance with the DJS-1000! With the intuitive controls of this standalone hardware sampler and sequencer, DJs have complete power over their sound for new and exciting musical expressions on stage. Step sequencer Easily create a new groove by tapping the 16 large, multicolored step input keys. You can keep an eye on sequence information on each track thanks to the keys’ changing colours. Multicoloured Performance Pads Use the 16 large rubber pads to trigger the tracks you’ve assigned samples and loops to. Each one is equipped with multicoloured illumination and highly accurate velocity detection, so you can increase or decrease volume with the amount of pressure you apply. • Home screen: View information on the sample assigned to each track thanks to the instrument icons and colours which are linked to the pads. • Sequence screen: View the sequence pattern currently playing. • Mixer screen: Adjust the volume balance of each track. 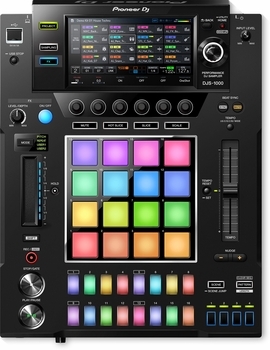 Accurate syncing with various external devices and systems In addition to clock synchronisation with MIDI devices, the DJS-1000 includes the Beat Sync function which can synchronise a performance by beat/bar with a track playing on a CDJ-2000NXS2 or XDJ-1000MK2 set-up using PRO DJ LINK. Use the tempo slider and the nudge buttons to quickly adjust tempo and beat position manually, just like you would on a turntable. Live Sampling Easily sample input sounds and immediately use them as individual tracks. The sampled sounds are automatically synchronised with the current sequence to play in a loop, so they can be dropped straight into a live remix. You can sample any input source, including audio from a turntable, via your mixer. FX Add various FX to tracks with ease, changing the tone on the fly. You can apply FX such as echo, reverb and filter to individual tracks, a group of tracks, or all tracks. Perfect fit in the DJ booth The DJS-1000 is designed to fit perfectly alongside the CDJ-2000NXS2 and DJM-900NXS2, creating effortless unity in the DJ booth.